BIXI is a new public bike system for Montr?al. The system plans to have over 300 bike stations and 3,000 bikes throughout the city. On average the stations are separated by only 300 metres, however, if you want to know where your nearest station is, you can find it on this handy Google Map. You can create your own map using graphics illustrator or just editing a Free vector Map Canada, mainroads, cities, borders, province borders, Adobe Illustrator, PDF, editable, printable. 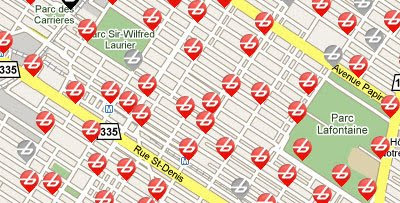 If you want to find a station when you’re out and about you can also access the map from your mobile phone at stations.bixi.com. On both maps it is possible to click on the bike station map markers and find out how many bikes and bike docks are currently available.